Sofia’s Aunt Tilly returns to give her a gift that will unlock a secret world and appoint Sofia storykeeper of magical books in “Sofia the First: The Secret Library,” the first episode of a four-part story arc, debuting MONDAY, OCTOBER 12 on Disney Channel (9:00 a.m., ET/PT) and Disney Junior (7:00 p.m., ET/PT). 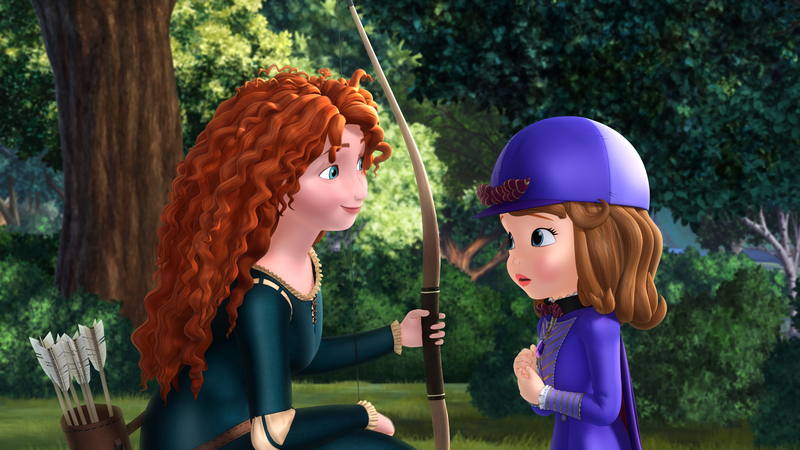 The episode features a special appearance by Merida from Disney•Pixar’s “Brave.” Bonnie Hunt (“Cars”) and Eric Stonestreet (“Modern Family”) reprise their roles as Aunt Tilly and Sofia’s flying horse, Minimus, respectively. Hugh Bonneville (“Downton Abbey”) lends his voice as the Narrator throughout the four-part Secret Library storyline. Additional guest stars include Cary Elwes (“The Princess Bride”) as nefarious Prince Roderick, Ruth Connell (“Supernatural) as Merida and Dean Norris (“Breaking Bad”) as Minimus’ brother, Mazzimo. Today, Tuesday, September 1, Disney Publishing Worldwide releases the illustrated storybook and e-book Sofia the First: The Secret Library, which introduces the tale of how Sofia becomes storykeeper of magical books without endings and now, must pursue adventures that will finish the narratives. An accompanying app featuring three exclusive stories and play experiences will be released on Thursday, October 8. A full-length preview and game for “Sofia the First: The Secret Library” will debut on WATCHDisneyJunior.com and the WATCH Disney Junior app beginning Monday, October 5. Disney Junior’s “Sofia the First” is the all-time record holder for the top two cable TV telecasts for Kids 2-5 and TV’s #1 series in Girls 2-5. It tells the story of Princess Sofia, an ordinary girl who becomes a princess and, throughout her journey, learns that possessing the characteristics of a true princess – honesty, loyalty, compassion and grace – is what makes one truly royal. The series stars the voices of Ariel Winter as Sofia; Sara Ramirez as Queen Miranda; Wayne Brady as Clover; and Tim Gunn as Baileywick. “Sofia the First” was developed by Craig Gerber and is directed by Jamie Mitchell. Gerber and Mitchell both serve as executive producers. Emmy Award winners John Kavanaugh and Kevin Kliesch are the series’ songwriter/music director and composer, respectively. “Sofia the First” is a production of Disney Television Animation. Disney Junior reflects the emotional connection generations of consumers have to Disney storytelling and Disney characters, both classic and contemporary. It invites mom and dad to join their child in the Disney experience of magical, musical and heartfelt stories and characters, while incorporating specific learning and development themes designed for kids age 2-7. Disney Junior’s series blend Disney’s unparalleled storytelling and characters kids love deeply with learning, including early math, language skills, healthy eating and lifestyles, and social skills. In the U.S., Disney Junior is a daily programming block on Disney Channel and a 24-hour channel reaching over 73 million U.S. homes. In total, there are 34 Disney Junior channels in 25 languages around the world. content as you probably did, the web will be much more useful than ever before. It’s not my first time to pay a visit this site, i am browsing this website dailly and get nice facts from here every day.